Today I bring you Ellen from South Holland. Another truly gifted nail tech. She got into doing nails 2 1/2 years ago when the garden center that she had been working at went bankrupt. 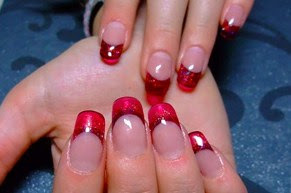 She decided it was time for a change and went to nail school for a year, plus did numerous extra nail courses including one-stroke nail art, dealing with nail biters, short nail artwork and nail filing. 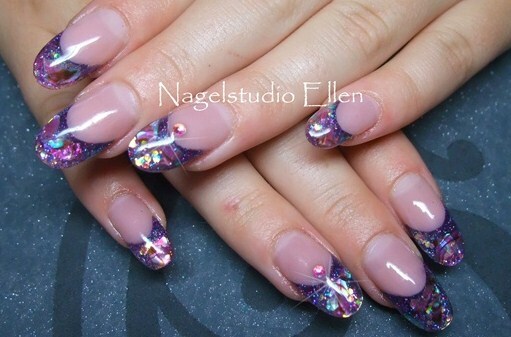 Now she works at Nagelstudio Ellen in Barendrecht, South Holland. I'm pretty much stunned by how good she is at nails after only 2 1/2 years. 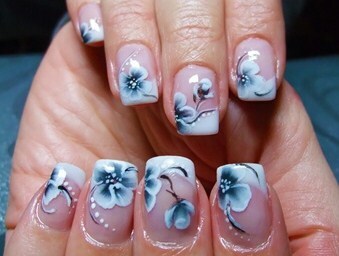 As always, her work speaks volumes for her talent - perfect smile lines, amazing sculpted nail art, meticulous one-stroke painting that creates life-like flowers. It doesn't get much better than this for us nail-addicts. So please check out her Salon's site, as well as her Nail art gallery :) You won't be disappointed! As always, don't forget to enter my Give away! The link to enter is on the side bar to the right!